For those unfamiliar with the term Functional Fitness, FF connects fitness to real-life function. Or another way to look at FF is fitness for the tasks you perform or may one day have to perform. 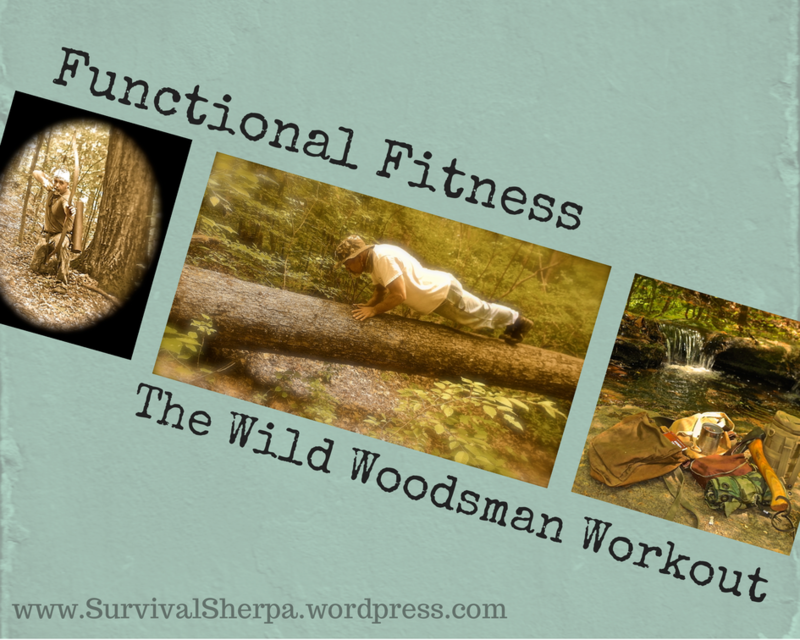 In a general preparedness mindset, I practice functional fitness because it’s fun and build skills. 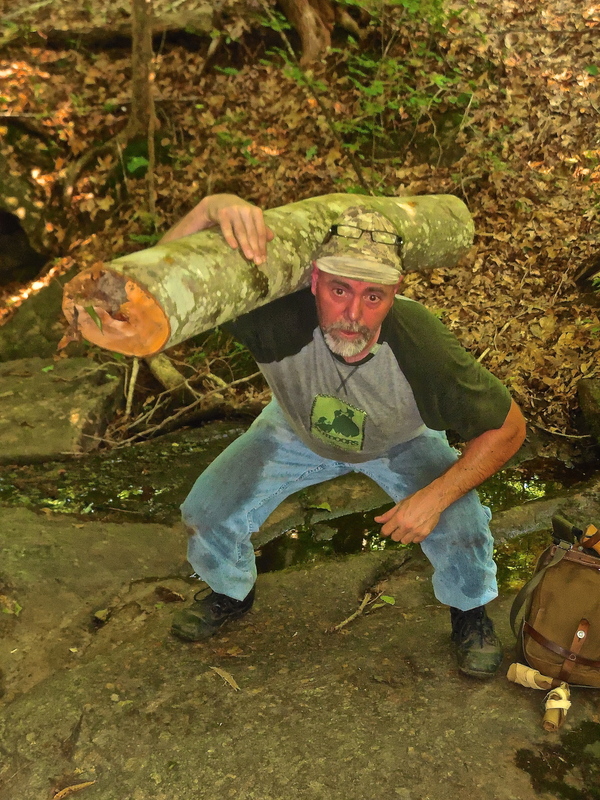 Though I have a bodyweight workout I follow, I wanted to up my game for a specific task – a wilderness survival school next month. I devote time in the woods (dirt time) practicing self-reliance, survival, and bushcraft skills but this is different. Will I have the endurance, strength (mental and physical), stamina to finish the course? We shall see. Ax – a sharp one! Wood – preferably in the woods. Backpack – if you’re have access to a wild area. Saw – buck saw, folding saw, limb saw, or crosscut saw. Water – hydration before, during, and after the workout. Any swinging motion done properly works your core muscles. Find a recently downed tree. 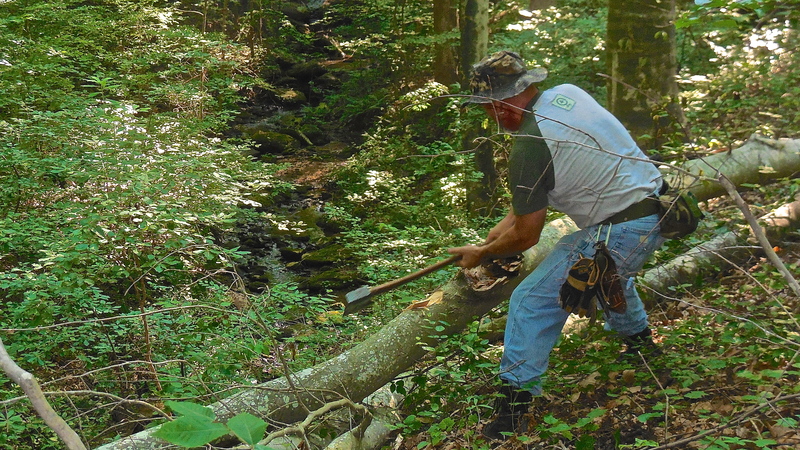 Older dead falls are likely to be too rotted. [For urban dwellers, a local park will do] If your decently fit now, I recommend selecting a hardwood with dense fibers (oak or hickory). For my workout equipment, I selected a large Beech tree uprooted by March storms. If you’re not familiar with ax safety, STOP right here! 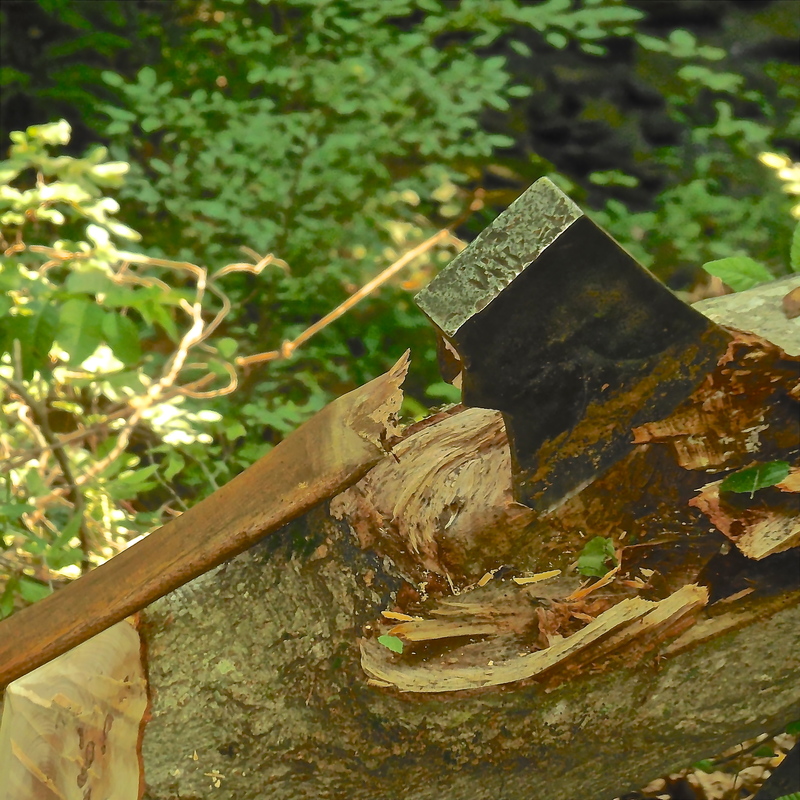 Learn the basics of cutting wood with an ax before proceeding. 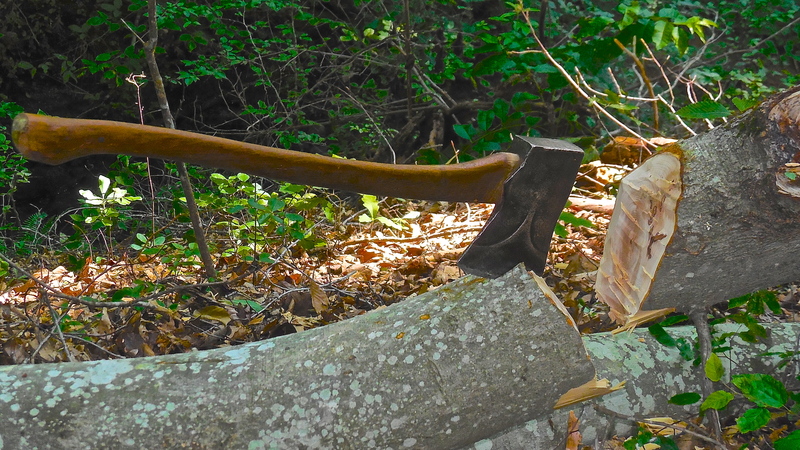 Until you learn this skill, substitute a sledge hammer for the ax and bang 0n an old tire in the backyard – which is an excellent workout in and of itself. You won’t see wood chips flying with the hammer, but you won’t cut off your leg or foot. Here’s a helpful video by Dave Canterbury if you’re new to swinging a cutting tool. First, tuck your pant legs into your boots and lace them snuggly. Apply insect repellant to clothing and exposed skin. Deet-free sprays are available. A commercial brand I use and find effective is Naturapel. I’m still working on my DiY formula. Now grab your pack and gear and hike to your fallen tree. 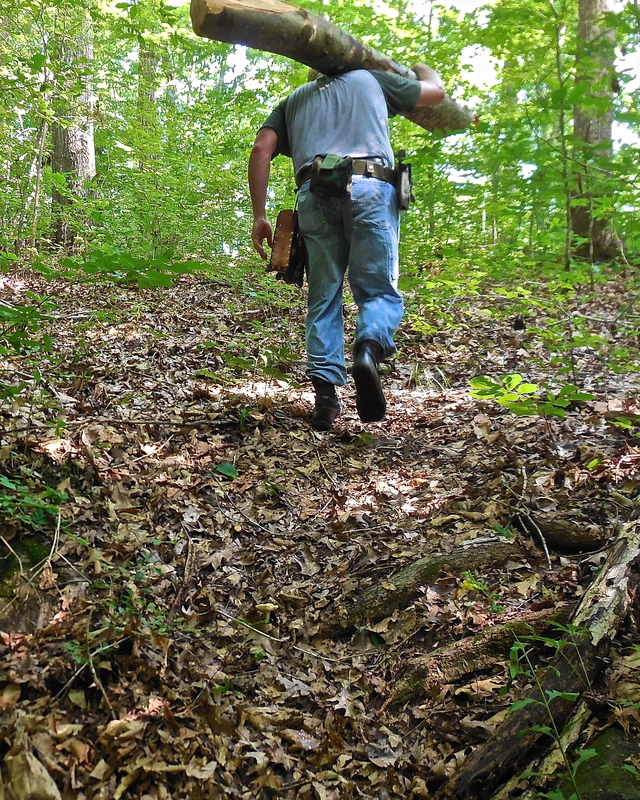 Carrying a loaded pack (mine weighs 25#) serves as your warm up exercise. Ideally, your tree will be laying on flat ground. There’s not many perfect situations in the wild. My tree was on a steep hill. Find a firm footing, cut away any obstructions in the swing path of the ax, and let the chips fly. 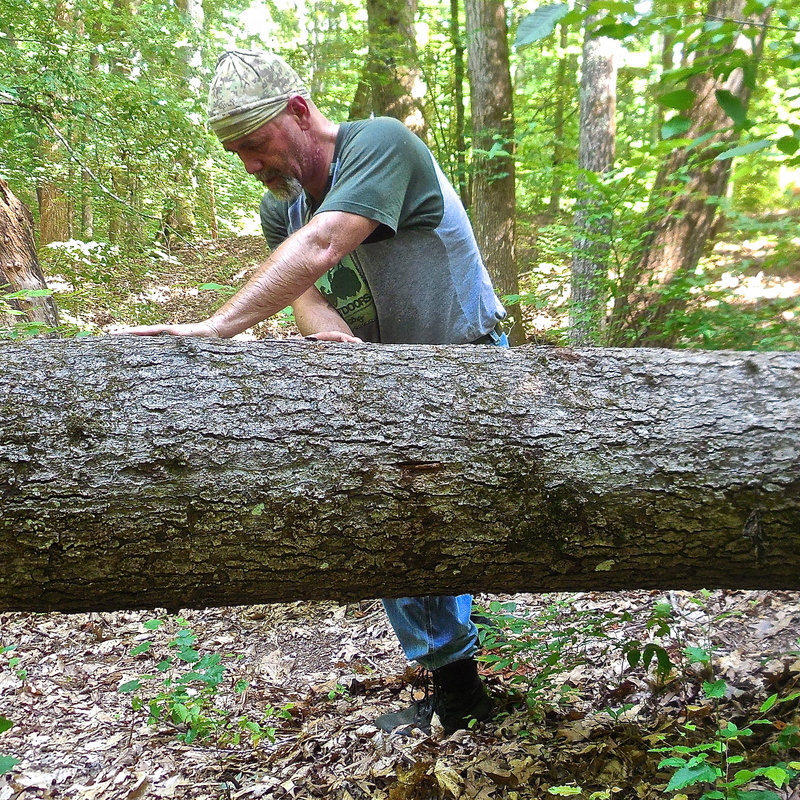 I set up on a portion of a limb that was about 10 inches in diameter. Your skill and fitness level will determine the diameter to cut (This comes into play later in the workout). Try to swing at a safe, steady rate until you sever the limb/tree. Take breaks as needed. Fatigue leads to sloppiness and puts you at risk for a stupid injury. 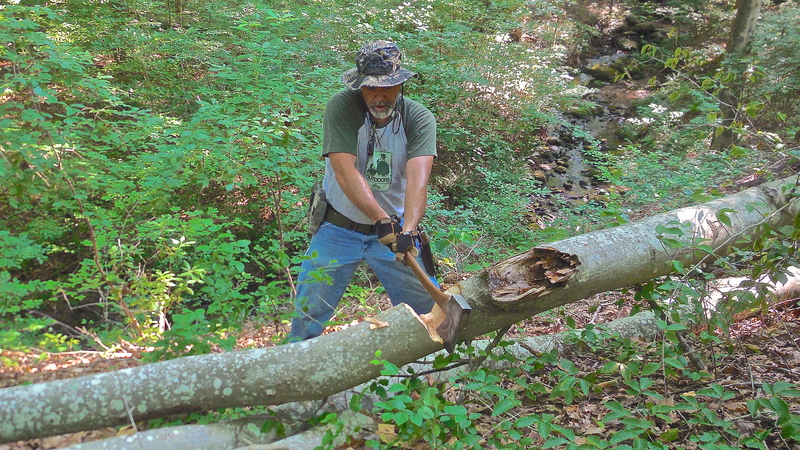 After cutting through one end, being on a steep slope, I cut two 4′ stakes (2″ in diameter) from the smaller end of this limb, sharpened them, and drove them into the ground to prevent the log from shifting downhill. Stake the log on the downhill side if you’re on a slope. Now you’re ready to cut a section from the log. A note on cutting tools. The ax I used was my True Temper Kelly Perfect I restored recently. On the second cut I noticed the head was loose on the handle. I figured I could make it through the cut and add a wedge when I got home. Nope. It broke. Make sure you check your equipment regularly and fix what needs fixing. 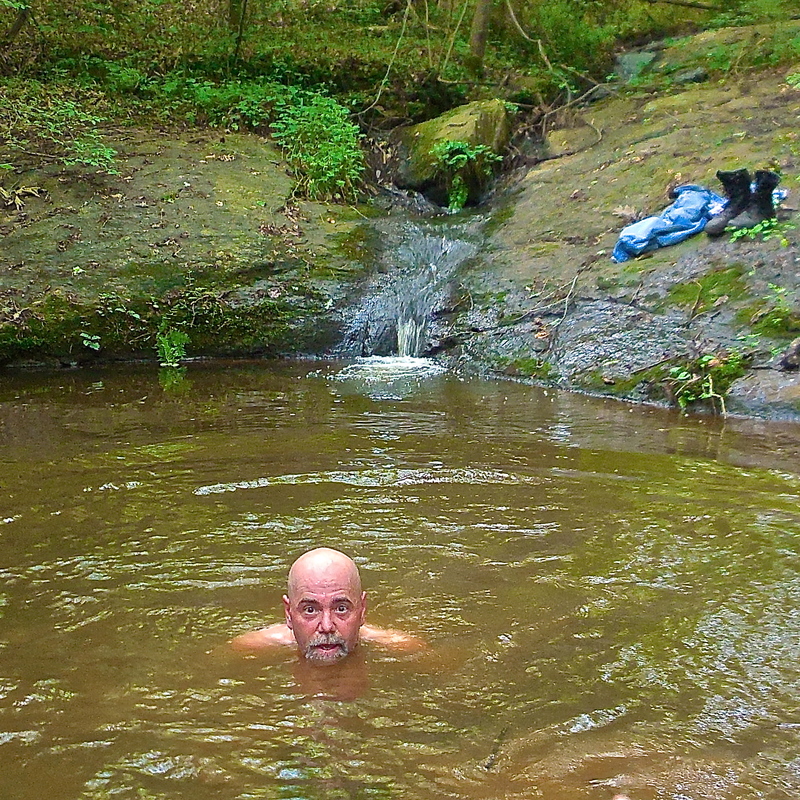 In a survival situation, I’d been up the creek without an ax! And this wasn’t a mis-hit. I intentionally brought my limb saw and I’m glad I did. Saw from underneath a notched log to relieve pressure and prevent binding. The sawing motion was an added bonus to the workout. Push-pull-push transfers to bow drill fires and the companies tug-of-war event. Finishing the second cut with my saw. It’s hot and humid in Georgia. Hydrate before, during, and after your workout! 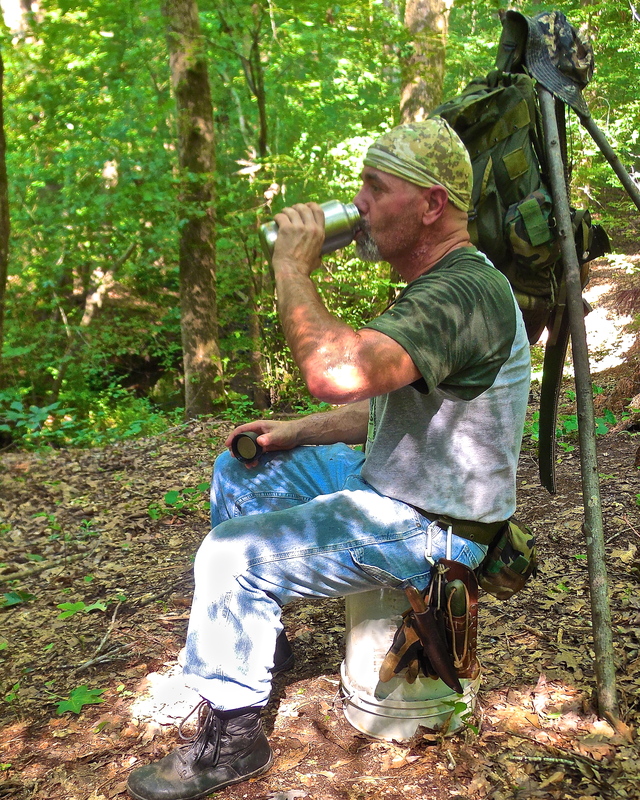 Water break at base camp! Congrats on successfully cutting timber! Now you have a new piece of workout equipment. 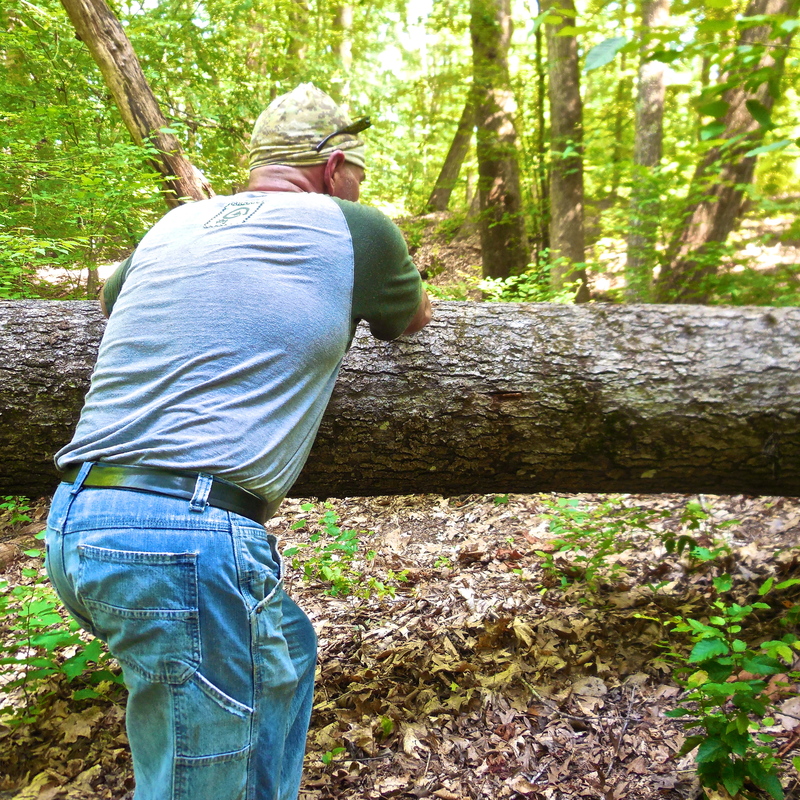 Stand it on end and place your shoulder about midway on the log. Grip the bottom end with your hands in a squatting position with your back as straight as possible. Use your legs and hips to lift the log onto your shoulders. Beech happens to have a very smooth outer bark which makes your next exercise easy on the neck and shoulder. I’d recommend de-barking logs with rough bark. 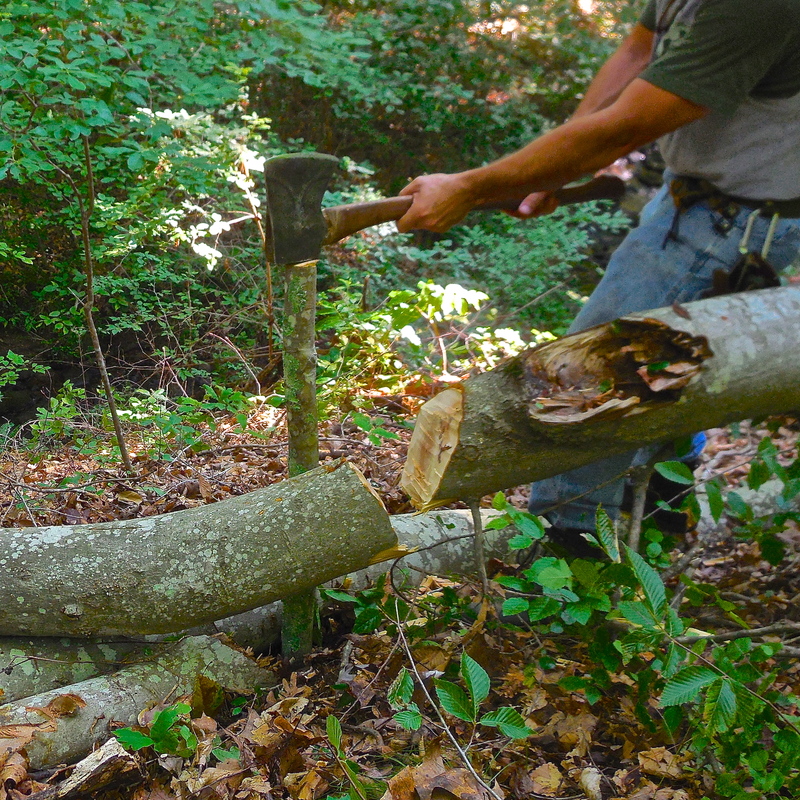 Use your ax or bring along a draw knife for this job. Maintain your balance and haul it to your next station. My leg-destroying station is in the creek bottom just down the hill. How many squats should you do? Depends on your present fitness level. I did 2 sets of 10. Keep your back straight, feet about shoulder width apart, head up looking straight ahead. Thighs should be parallel to the ground at the bottom of the squat. Drop the log and drink water. Shoulder the log and walk up a hill if one is available. You never know when you may be called upon to haul a buddy to safety. This doesn’t replicate the rescue exactly but will light your calves and quads on fire. Uphill gets more for your money. Walk down and repeat five times. There’s no set distance. Do what you can do. Plyometrics are awesome for developing explosiveness. For this one, find a stump, rock, park bench (for urban jungles), or fallen tree trunk. My equipment was too high for me to do straight up plyometrics – jumping from the ground over the top of the obstacle and back down again like a pommel horse. 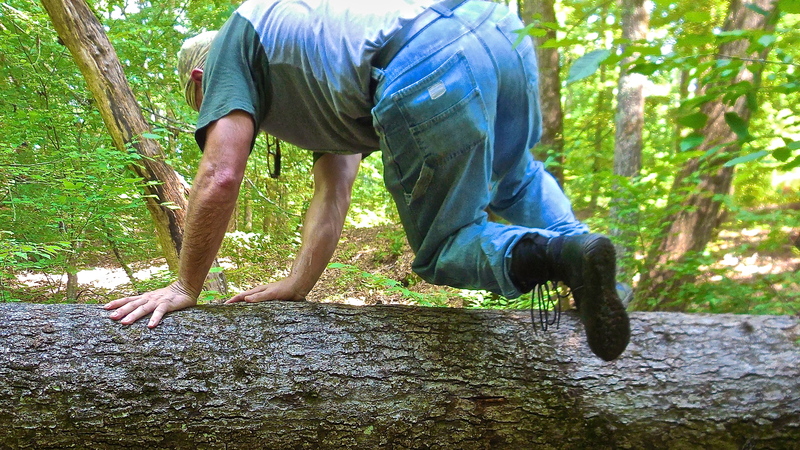 Might as well throw in a few push ups on the log while you’re there! Checking for ticks and other creepy-crawlies. Found one! The purpose of functional fitness is to prepare your body and mind for real-life tasks. It’s not about counting reps and bench pressing the world but more about training your body for situations you’re likely to encounter in daily life. 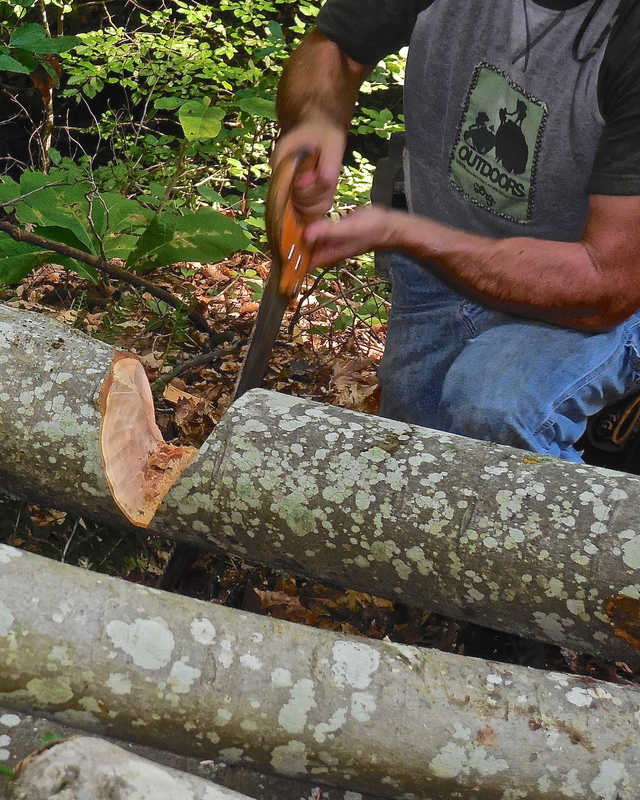 An added bonus is the mental and emotional satisfaction gained from Doing the Stuff of self-reliance with simple tools and makeshift equipment. Could you fireman’s carry a family member to safety – or split firewood without hydraulic equipment – or hoe that long row in your garden without having a stroke? You may never have to prove your worth in this regard but what if’s do happens. Great ideas! I guess, you would need to be very creative if you want to perform some of these activities in an urbanized setting. But, I agree with you, there are many ways to keep yourself active that don’t require to go to the gym. Local parks usually have stuff to climb, limbs for pull up bars, and park benches. I’ve made those my gym when not in the woods. Thanks for the comment, Marina!